Trading Market Commodities: Big Oil May Finally Get to Drill in the Arctic, But Is It Worth It? Big Oil May Finally Get to Drill in the Arctic, But Is It Worth It? Far above the Arctic Circle, one of the longest-running controversies in U.S. oil drilling is about to reignite. 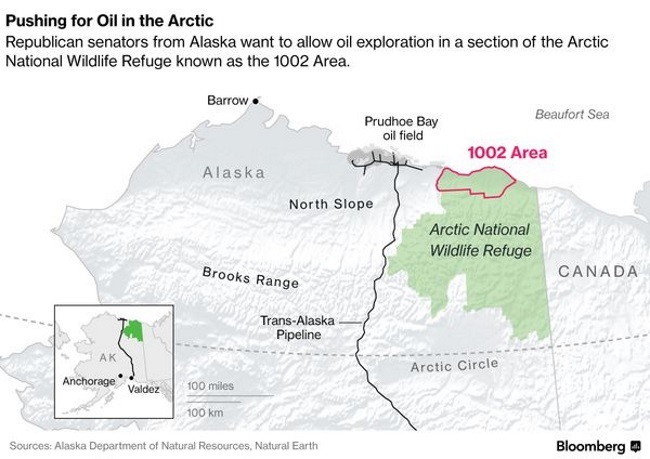 Bouyed by Donald Trump’s election, Republicans are pushing to allow oil exploration in the Arctic National Wildlife Refuge, the frigid wilderness in northern Alaska that’s been a political battleground for drillers and conservationists for decades. The prospects for industry look better than they have in years, with Republicans in control of Congress and Trump vowing to boost U.S. energy production. There’s just one catch. No one really knows how much oil actually lies beneath the refuge, or how much producers like Exxon Mobil Corp. and ConocoPhillips care about it in a world awash in cheap oil, from Texas shale to offshore Africa. While the government estimates the area could hold 12 billion barrels of crude, making it one of the biggest untapped reserves in the U.S., no one’s sunk a well there since the 1980s. That may be about to change. The aging Trans Alaska Pipeline, once the symbol of energy independence for an oil-strapped nation, is now on the verge of obsolescence. 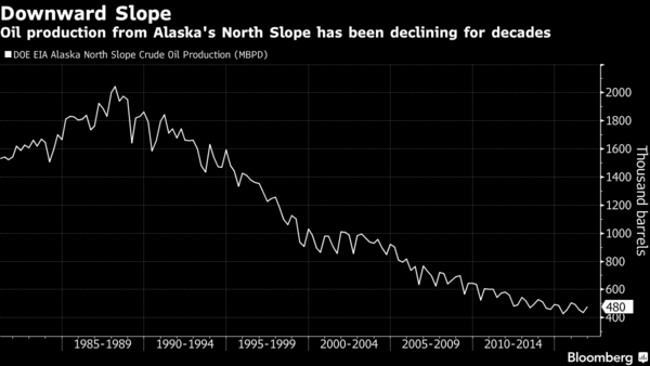 The 800-mile system links northern Alaska to the rest of the world, but its output has been falling as fields outside the refuge fade out and supplies from shale oil in the lower states grow. While it may take a decade for ANWR to start producing oil, the new supply would go a long way toward ensuring the survival of the pipeline and the jobs that go with it, according to U.S. senators Lisa Murkowski and Dan Sullivan. The two Alaska Republicans introduced legislation this month to allow development of as many as 2,000 acres in the refuge. “For nearly 40 years, Alaskans have proven that we can responsibly develop our natural resources while protecting the environment,” Murkowski said in a Jan. 5 statement. State residents, moreover, “overwhelmingly support responsible development” of the refuge. Created by Congress in 1980, the refuge provides a critical habitat and breeding ground for polar bears, wolves, migratory birds and caribou, among other species. It covers 19 million acres in northeastern Alaska, stretching from the mountains of the Brooks Range and boreal forests to a vast, snowy coastal plain that slides into the Arctic Ocean. Yet from the moment it was created, ANWR has been coveted for its untapped oil. The refuge was set aside even as the U.S. ramped up production in the North Slope, in response to the shock of oil embargoes in the 1970s. Just how rich the prize is remains to be seen. A 2005 review by the U.S. Geological Survey, based on decades-old data, said ANWR may hold as many as 11.8 billion barrels of crude. If that were proven true, it would rival the mammoth Prudhoe Bay field that sparked the Alaskan oil rush 40 years ago, the kind of elephant-sized find that would generate income for decades. That could appeal to companies looking to balance the short lifespans of shale fields and the risks of operating in more politically fraught parts of the globe. But only one well has been sunk in the refuge, an exploratory project by BP PLC and Chevron Corp. in 1985. The results, deemed proprietary, were never made public. BP, when reached for comment, referred questions to Chevron, which did not respond. Given the extreme conditions in Alaska, oil would have to sell at about $70 a barrel to make most of it economical to recover. Today, prices hover around $55. The subzero weather and remote distances mean drilling in Alaska typically costs three times as much as in the Lower 48, according to industry researcher IHS Markit Inc.
Exxon Mobil referred questions to the American Petroleum Institute, the industry’s Washington lobbying group. The institute said in a statement that it believes the refuge can be developed in a “safe and responsible” way. ConocoPhillips, Alaska’s biggest oil producer, agrees, spokeswoman Natalie Low said in an e-mail. Even if oil prices rise significantly, myriad questions remain. Are the ANWR reserves concentrated or spread out? Mixed with natural gas? At today’s prices, though, such questions are moot, said Imran Khan, a senior research manager in Houston at Wood MacKenzie Ltd., an industry consultant.